If Ramin Zarrabi had his way, every person considering a new boat from the Tracker Marine Group would first tour the company’s plant in Miami, Oklahoma. While he may not be able to provide tours to every potential buyer of the factory’s primary product—the Tahoe boat—he has gladly laid out the welcome mat to community groups and other manufacturers who want to tour the impressive facility. There was a time not that long ago when such a tour would have been unimaginable. But one of the first orders of business he undertook after coming to Tracker Miami two years ago was working on a culture of pride within the walls of the plant. Tracker Miami operation is a 53-acre campus with number of buildings dedicated to manufacturing, aftermarket and distribution. Miami plant produces fiberglass runabouts, deckboats and light inshore fishing boats under Tahoe and Mako brands. While the figures are impressive, the number that matters the most is the 200-plus employees who keep the plant moving forward under a philosophy of continuous improvement. Teams in the plant’s four areas (Mold preparation, Gel coat, Lamination & Final Assembly) focus on four aspects of business throughout the production cycle: safety, quality, delivery and cost. 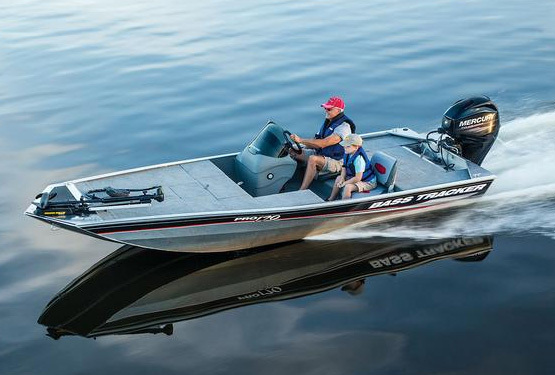 “We strive to provide a safe, uncompromising and inspiring place to work that produces quality boats while continuing to develop our team,” said Amy Wyrick, human resources manager at facility in northeastern Oklahoma. Miami plant is committed to the Lean Manufacturing philosophy of continuous improvement. Lean Manufacturing is an active and constantly improving process dependent on the understanding and involvement of all the company’s employees. Display boards sit prominently in every area of the plant, with the main priority being tracking the four areas of focus. The goals are relatively simple: zero accidents, zero defects in product, delivering the product in a timely manner, and eliminating waste while improving quality and productivity. The board isn’t just a device for plant leaders to track progress, however. There are ample areas on each panel for employees to make suggestions, with a device to track all actions taken on the suggestion. Marsha Cole, a Manufacturing Extension Agent with the Oklahoma Manufacturing Alliance, has been working with the Tracker Miami plant for the past five years. Cole said she is amazed at the number of positive changes made throughout the Tracker Miami operations and with the optimistic shift in attitude among employees. She acknowledges that such a culture change can only occur from the top down, and leaders at all levels of this organization do an outstanding job of leading by example. Cole is one of 20 Manufacturing Extension Agents working in communities across Oklahoma. She is sponsored locally by the Northeast Technology Centers and the Grand Lake Manufacturers’ Council. The formation of a Kaizen Promotion Office has resulted in significant improvement at Tracker. The Kaizen Promotion Office consists of number of supervisors and team leaders who are pulled out of operational roles and dedicated for six months to learning Lean principles and applying them across the value stream using Kaizen methodology. Furthermore, plant’s six supervisors rotate through the four production areas as well as the promotion office in a six month intervals, giving them a better picture of production from beginning to end. “Our vision is that people that have gone through the rotation can more easily bridge over to other areas of the plant,” said Zarrabi. Tracker Miami has gone beyond the four walls of the factory and have implemented the Lean concepts across the entire supply chain by implementing lean logistics principles that have increased delivery frequencies, inventory turns and more effective communication with suppliers. Cole said while the Tahoe Team is quick to open the plant doors for tours, they are just as eager for the leadership team to tour other area facilities. It’s a two-way road. Cole now brings plant managers from other companies into Tracker Miami to benchmark the efforts there. “And Marsha has been a tremendous source of benchmarking by connecting us to others in an effort to build our leadership team,” added Zarrabi. The road to positive change has not been paved without difficulties. For instance, when Zarrabi first arrived at the Tracker Miami plant, he was greeted with a collapsed roof caused by a massive ice storm a few months earlier. The decision was made to turn the negative into a positive, with a new and improved building going up a short time later. The Miami Tracker Marine plant has used the same philosophy during the current economic downturn. While many companies probably see the glass half empty when viewing the economy, the Tracker Team sees the climate as a prime opportunity to further advance employees and products. “The downturn has provided a good opportunity for us to really focus on training our employees,” Zarrabi said. The investment in people has begun paying dividends in hiring and retaining quality employees. There was a time not long ago that attracting quality employees proved extremely difficult. Many employees looked at the plant as just a job. Now, Wyrick said, most employees truly feel a sense of pride and ownership in Tracker Miami. Standing in the middle of the main plant, it’s difficult for Zarrabi to keep his enthusiasm at bay as he talks about the positive changes made so far at Tracker Miami, and the endless potential he sees. “It’s been an amazing journey for us. We have made tremendous progress here. We have laid a foundation that we can now build upon,” he said. “If you look around, we have touched every area of our value stream. With the Tahoe and Mako boats we want to deliver highest quality products that match Tracker’s value proposition to our customers.